The number of measles cases reported worldwide in the first three months of 2019 has tripled compared with the same time last year, according to the World Health Organization (WHO). The UN body said provisional data indicated a “a clear trend”, with all regions of the world seeing outbreaks. Africa had witnessed the most dramatic rise – up 700%. The agency said actual numbers may be far greater, since only one in 10 cases globally are reported. Measles is a highly infectious viral illness that can sometimes lead to serious health complications, including infections of the lungs and brain. Ukraine, Madagascar and India have been worst affected by the disease, with tens of thousands of reported cases per million people. Since September, at least 800 people have died from measles in Madagascar alone. Outbreaks have also hit Brazil, Pakistan and Yemen, “causing many deaths – mostly among young children”. A spike in case numbers was, in addition, reported for countries including the US and Thailand with high levels of vaccination coverage. The UN says the disease is “entirely preventable” with the right vaccines, but global coverage of the first immunisation stage has “stalled” at 85%, “still short of the 95% needed to prevent outbreaks”. Why the sudden ‘global measles crisis’? It is one of the most contagious viruses around, however, nothing about measles has changed. It has not mutated to become more infectious or more dangerous, instead the answers are entirely human. There are two stories here – one of poverty and one of misinformation. In poorer countries fewer people are vaccinated and a larger portion of the population is left vulnerable to the virus. This creates the environment for a large outbreak to occur – such as those in the Democratic Republic of the Congo, Kyrgyzstan and Madagascar. But rich countries with seemingly high vaccination rates are seeing cases spike too. This is because clusters of people are choosing not to vaccinate their children due to the spread of untrue anti-vax messages on social media. It is worth noting these figures are provisional, the WHO says the true figures will be much higher. And that measles is far from harmless. It kills around 100,000 people, mostly children, every year. In an opinion piece for CNN, WHO heads Henrietta Fore and Tedros Adhanom Ghebreyesus said “the proliferation of confusing and contradictory information” about vaccines was partly to blame. “It is understandable, in such a climate, how loving parents can feel lost,” they said, but added that “ultimately, there is no ‘debate’ to be had about the profound benefits of vaccines”. In response to recent measles outbreaks, calls have mounted in several countries to make immunisation mandatory. 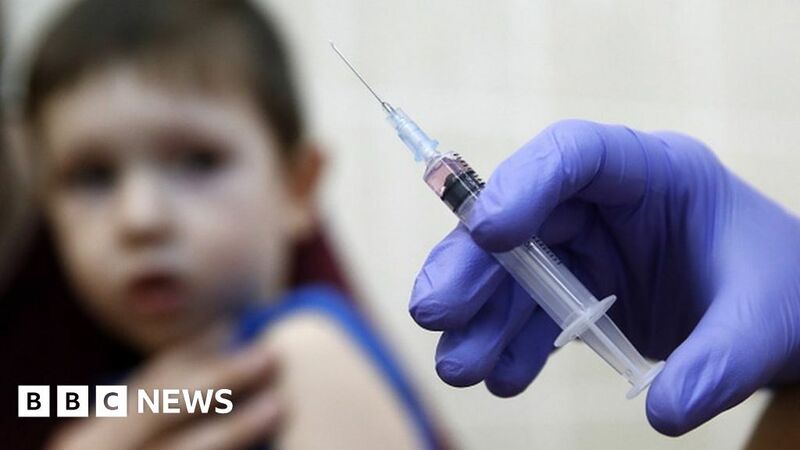 Last month, Italy banned children under six from attending schools unless they had received vaccines for chickenpox, measles and other illnesses. A public health emergency has also been declared in areas of New York, ordering all residents to be vaccinated or face a fine.